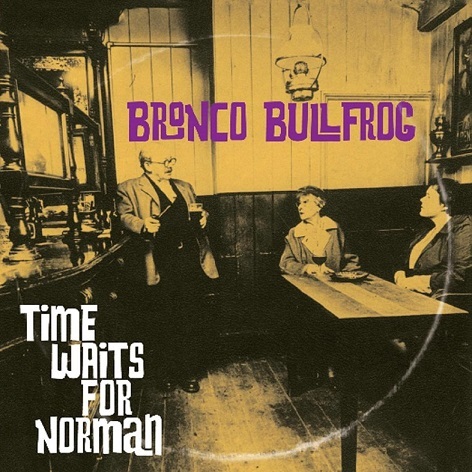 In the mid-90s Andy Morten (drums and vocals), Mike Poulson (vocals and guitar), and Louis Wiggett (bass and vocals) formed the neo-60s band Bronco Bullfrog, named after the 1970 b&w film of the same name. They went on hiatus for a few years and then reformed in 2011. This is their third release since reforming and the first on Fruits de Mer’s Regal Crabomophone lable. It is as if the intervening 40 years never happened. On this new 7-inch we have three different styles of Brit psych-pop. The first two songs are originals, “Time Waits for Norman” and “Rocking Horse Mender.” The third, “Listen to the Sky,” is a cover of an obscure 1967 B-side by Sands. “Time Waits for Norman” is pure psych-pop with wah wah guitar and lots of vocal harmonies calling to mind very early Syd Barrett and Pink Floyd (“Arnold Layne”) as well as hints of The Kinks and The Beatles. “Rocking Horse Mender” takes you in a different direction with its nursery rhyme theme. This is a very melodic tune that could have easily been released in 1968 and drawing comparisons to another Fruits de Mer band The Luck of Eden Hall. “Listen to the Sky” is an excellent song to close the disc and is a much heavier and edgier song than the other two. Quite a nice addition to the Fruits de Mer catalog.